Holt | Scuffalong: Genealogy. Holt – Scuffalong: Genealogy. John J. Holt (4 December 1923-9 March 2016). My father’s first cousin John Holt, the oldest male in all our extended Henderson clan, has passed away. I have written of him here and here. Rest in peace. My grandmother and her nephew John, Greensboro, early 1980s. 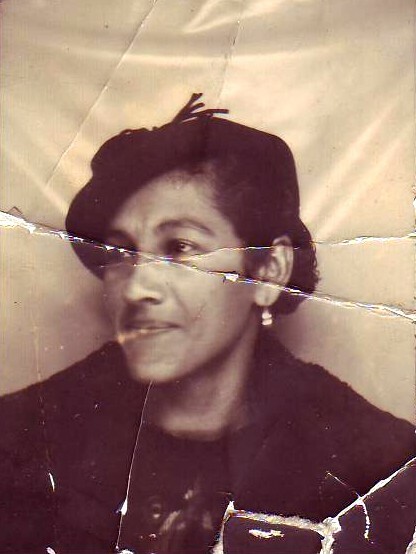 Remembering my grandmother’s beloved sister, Mamie Henderson Holt, on what would have been her 108th birthday. It never occurred to me to wonder “Why Greensboro?” We grew up regularly rolling 125 miles into the North Carolina Piedmont to visit my grandmother’s sister and the four nieces who lived nearby. 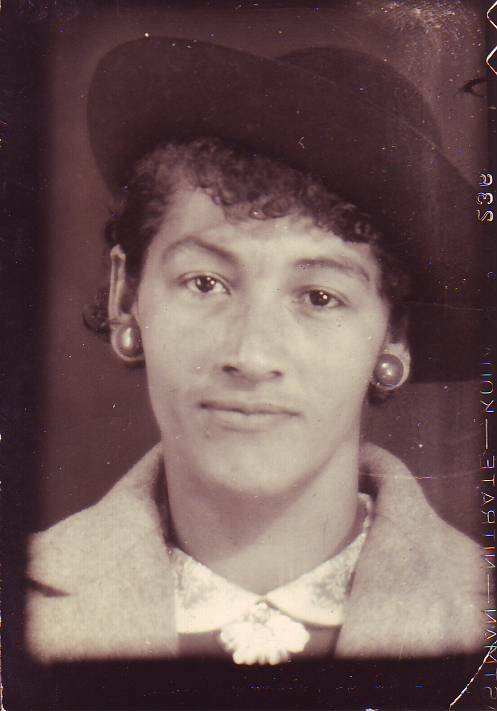 Beyond my first cousins, their children were the closest kin we had in age, and we were always excited about a trip to see “Aint” Mamie Henderson Holt. It was not until I began interviewing Mother Dear in the 1990s that I learned that Aunt Mamie had not been the first Henderson to settle in Greensboro. That pioneer had been Julia “Mollie” Henderson Hall Holt, daughter of James and Louisa Armwood Henderson, half-sister of Lewis Henderson, aunt of “Mama” Sarah Henderson Jacobs Silver. An introduction: Aint Mollie didn’t have long hair, but it was nice. And curly. And it was thin. And she had that, she wasn’t real light-complected, she was kind of olive-colored. But she was a small-sized woman. She was tall, not like Mama. She wasn’t fat. And she seemed to be real nice. By 1910, Walter and Mollie and her daughters (known henceforth as Holts) were in Greensboro, living in the Wilmington Street home that my grandmother knew. 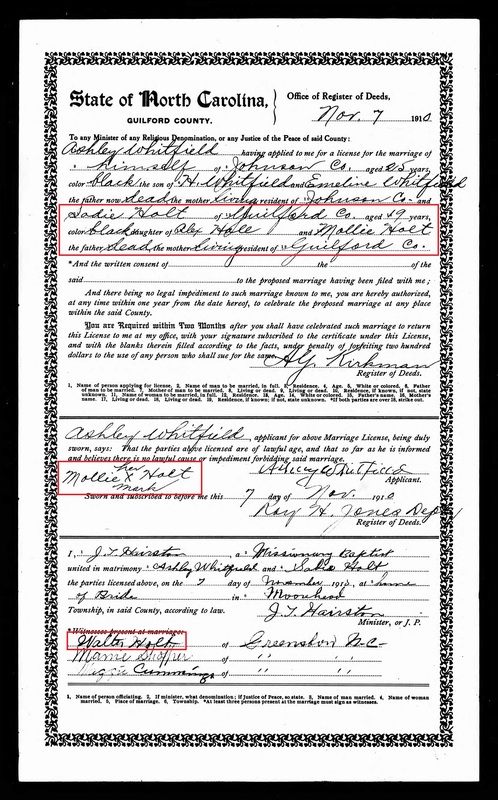 And Bazel’s – Mamie’s Bazel, his uncle Walter Holt married Aint Mollie. They didn’t never have no children, but she had two girls before they got married – Sadie and Julia [sic, Lula.] Yeah, them was the girls. Two girls. Sadie died. Julia, too, I believe. I think both of ‘ems dead. Sadie didn’t have no children of her own, but she raised a child. She took somebody’s child and raised. She had a husband, too. What was his name? I remember seeing him once or twice. I don’t believe Julia ever got married, I don’t think. At least she didn’t say nothing ‘bout it. They were older than me. And I think Mama said that Mollie was older than she was, but I reckon they was ‘long there together. Nancy was older than both of them, and A’nt Ella was the youngest one. She and Mama always were together, ‘cause they all played “sisters.” But Sarah was really Mollie and Nancy and Ella’s neice. Their brother Lewis’ child. She had two daughters, Sadie and Julia. I think that’s what it was. Sadie’s the one stayed in the house on the corner from where we were staying, right there on Wilmington Street. The other one – where’d the other one stay? She was married and stayed in Virginia somewhere. Yeah, Julia. Sadie’s sister. Cousin Mollie, A’nt Molly’s daughter Julia. She had a daughter. Julia was light-complected, but she wasn’t real fair. She had a light complexion. And I didn’t know her husband. I don’t know if I ever seen him. But this child that she took and raised, I want to say took and raised up, she was real dark. They all left and come up to Virginia, I believe it was, Norfolk or somewhere. I know Sadie died in Greensboro, but…. A’nt Mollie, she died there, and I think her husband, I think he left. At least, he was running – he was a fireman on the train, that was his job. He was running between Winston-Salem and somewhere in, I don’t know…. Some part of Virginia or something. He was a tall, brown-skinned man. He was a nice-looking man. Here is Sadie’s first marriage license. 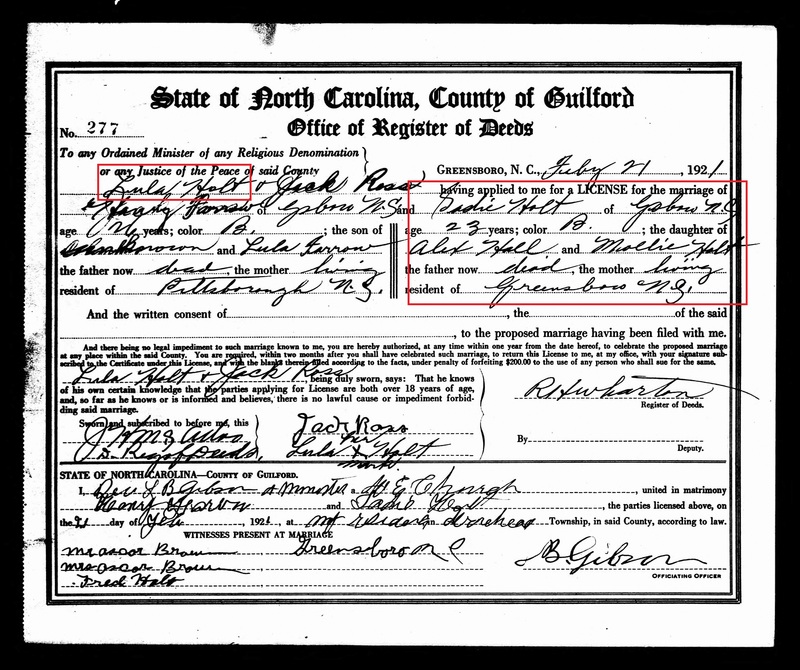 She married Ashley Whitfield of Johnston County in Greensboro a few months after the census above was taken. She used the maiden name Holt and noted that her birth father, Alex Hall, was dead. Her stepfather Walter Holt signed the license as a witness to the ceremony. 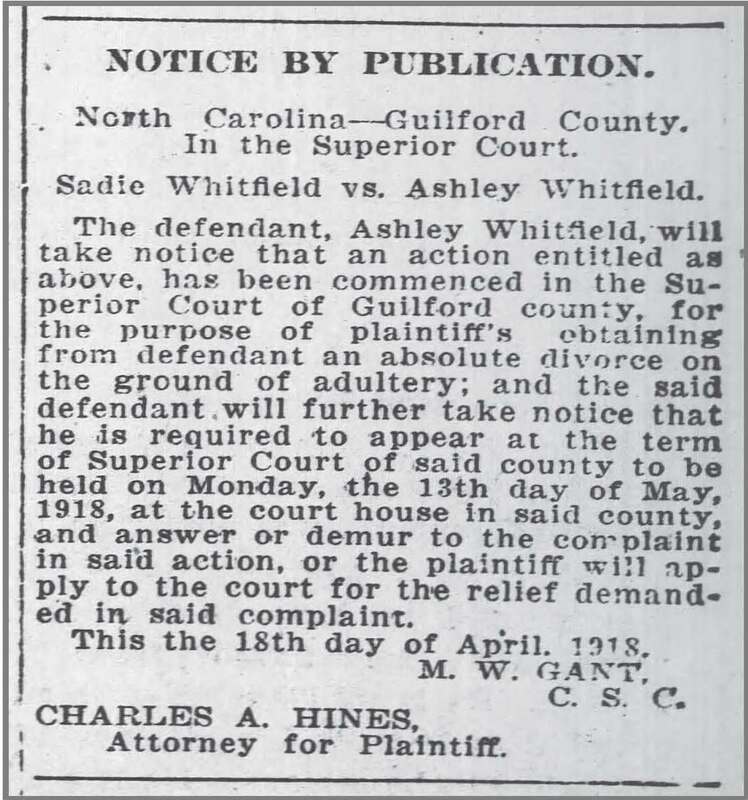 Greensboro Patriot, 16 May 1918. Some time in the fall or winter of 1922, Mama Sarah left Jesse Jacobs. She and her girls Mamie and Hattie took a train from Wilson to Greensboro to live with Aint Mollie until they got settled. While Sarah worked in a small restaurant, my 12 year-old grandmother enrolled in a Greensboro elementary school. (It was the last stretch of formal education she would have.) In early February 1923, they finally got their own place. 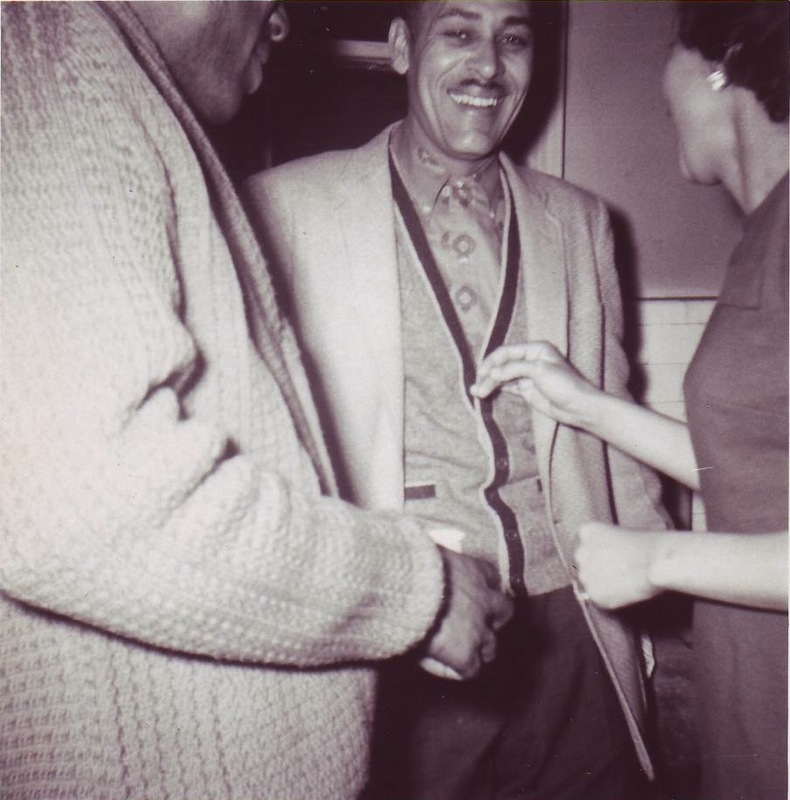 But Papa Jesse soon arrived in Greensboro to beg Mama back and, ill and struggling financially, she agreed to go. Aunt Mamie, however, had different plans. We moved in this house, and we hadn’t been in there but ‘bout a week, and Mamie wouldn’t come. She stayed over there with Aint Mollie. And Sadie. And so when she come over one day, and Mama didn’t feel like going to the restaurant where she had over there, and so I sat there looking out the window, and I said, “Mama, here come Mamie with a suitcase.” And I’d went over to the house that day, too. And I thought it was, they played cards then. [Inaudible.] So I went over there to Sadie’s house, and so I said to ‘em, I said, “What, y’all having a party tonight?” And didn’t know Mamie was getting married that night. Mamie didn’t even tell me. And so they said, “Yeah, yeah. Yeah, we gon play some cards.” And they wanted to get rid of me. Because they hadn’t told us nothing ‘bout it. Sadie went with Mamie to the courthouse to get the license and everything, and so Mamie didn’t want to come back to Wilson ‘cause Papa wasn’t good to her. But Mamie was up to Sadie’s house, Aint Mollie’s daughter. She stayed up there, ‘cause they all stayed up there and played cards. And she hadn’t seen Bazel but two weeks before they got married. So I went over there that evening after something from the café where Mama was, and I told her that Mama wanted her to come home. So she said, “Well, I’ll be over there tomorrow.” And so the house was all clean, Sadie’s house was all cleaned up, and tables sitting all around the room. Well, they played cards all the time, so I didn’t think nothing ‘bout it, and so they had to wait ‘til I left so Mamie and Bazel could get married. Went and got the license and everything. And didn’t tell me a word about it. And they were getting married that night. So I come on home. I run all the way from over there to Bragg Street. And come home. Didn’t think nothing about it. And so Mama, she didn’t go to the café, the people she had working in there, they was gon open up the café. ‘Cause it wasn’t nowhere but right down the street there, from ‘round the corner. So I stayed there with Mama fixing some breakfast. And so she said she wasn’t hungry, but I said she need to eat something. Well, anyway, she ate a little bit. And I looked out the window, and Mamie was coming with a suitcase. And I said to Mama, “Mamie’s coming up, and she’s got a suitcase! I wonder where she’s going.” Didn’t know she was coming to get her clothes. So she came on in, and she told Mama that she had got married last night and was coming to get her clothes. And Mama told her she ought not to let her have them. “You didn’t tell me nothing ‘bout it. If you was gon get married, and you’d a told me, [you could have] got married and had a little social or something.” And Mama was mad with her because she got married. So Mamie just got her clothes. Some of ‘em. And crammed ‘em in a suitcase and went back over …. 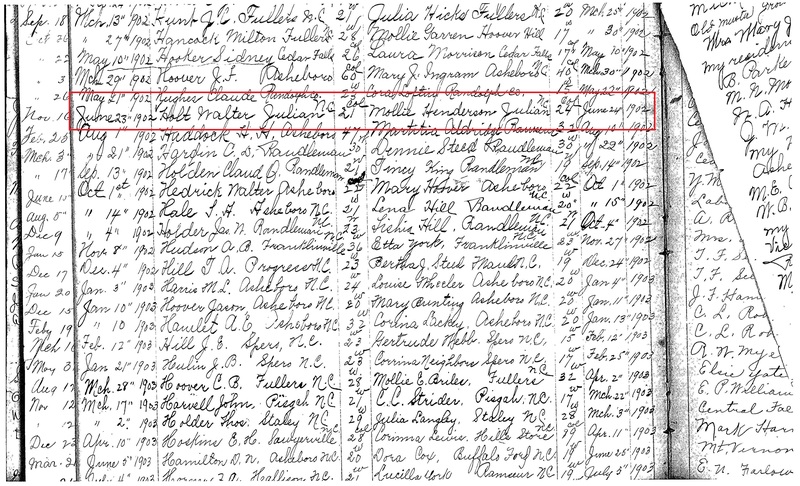 Mother Dear returned to Wilson with Sarah and Jesse Jacobs, and Aunt Mamie remained in Greensboro with her new husband, who was Mollie Holt’s nephew by marriage. And that’s how she got there — and stayed. 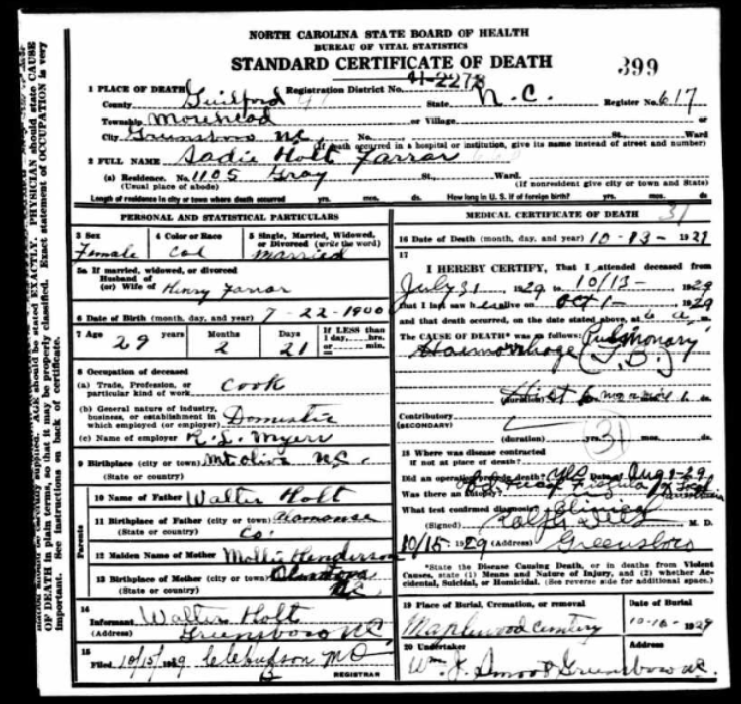 The following year, Sadie Hall Holt Whitfield Farrow died of tuberculosis. She was 38 years old. (Not 29.) Walter Holt was the informant on her death certificate and named himself as her father. 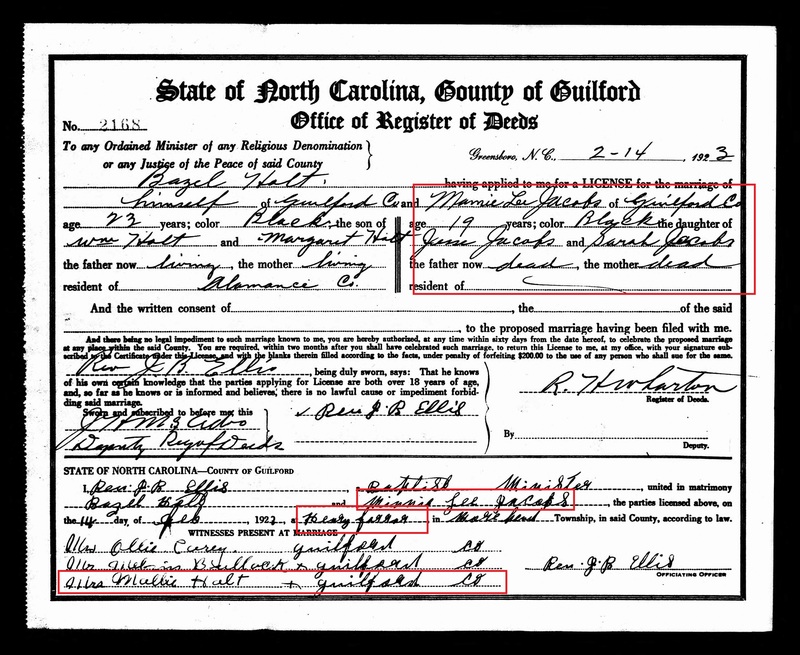 Otherwise, he correctly identified her birthplace as Mount Olive (in Wayne County), her mother’s maiden name as Henderson, and her mother’s birthplace as Clinton (or, in any case, Sampson County.) I strongly suspect that Mollie was dead by then, but I have not found evidence. By 1929, Aunt Mamie’s three oldest children had been born. The Holt branch of the Henderson family had taken root in Greensboro. It still flourishes there, but also in New Jersey and New York and Pennsylvania and Georgia and Texas. My grandmother and her sister Mamie had five sons between them. Two survive — the youngest, my father, and the oldest, my cousin John, who turns 91 today. Happy birthday, John J. Holt! 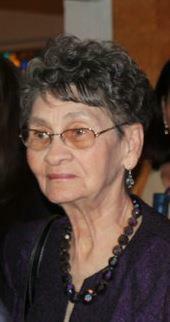 Remembering Hattie Mae Holt Crawford. 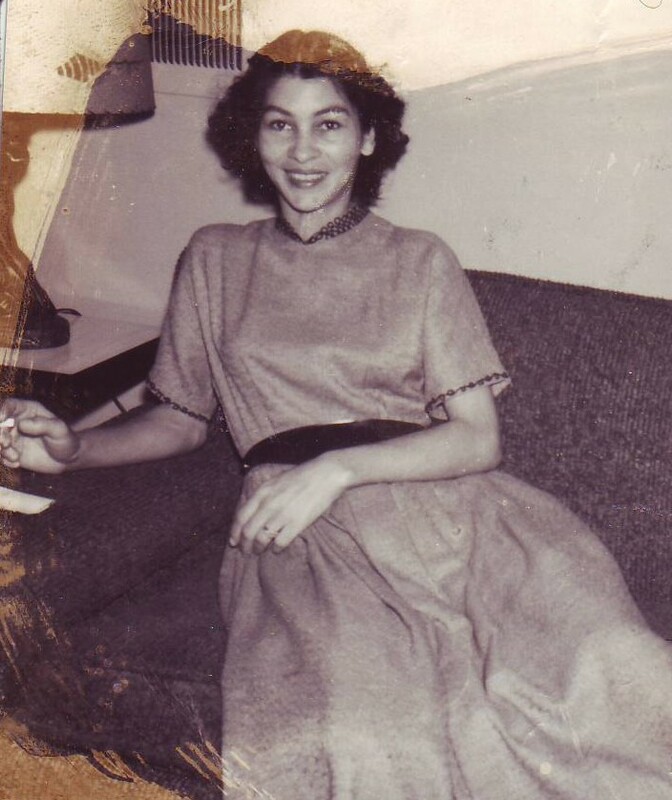 Remembering Hattie Mae Holt Crawford (18 May 1930-23 September 2011), daughter of Basil and Mamie Henderson Holt. Sidenote: the first picture was taken on a visit to Wilson circa 1940. 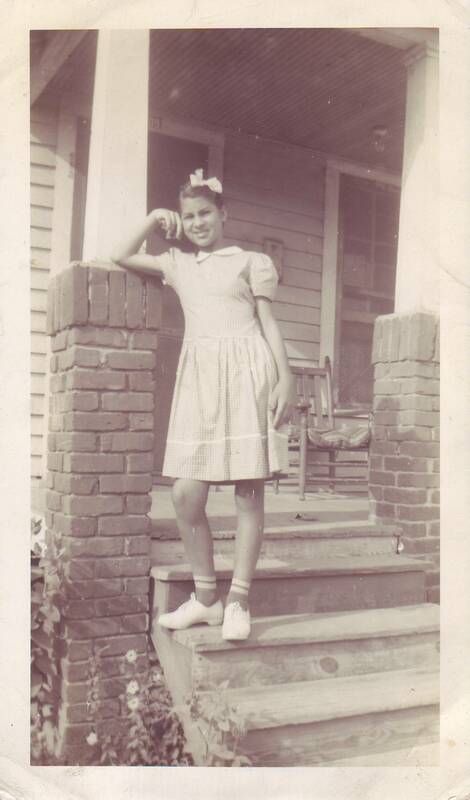 Cousin Hattie Mae was standing on the porch of 1109 Queen Street.